"EI was a project by curator Veerle Wenes in corporation with the Modern Chinese Art Foundation. 12 Dutch and Belgian designers and artists were invited for a month’s stay in Beijing (China) to work with Chinese artisans and return with some new products. 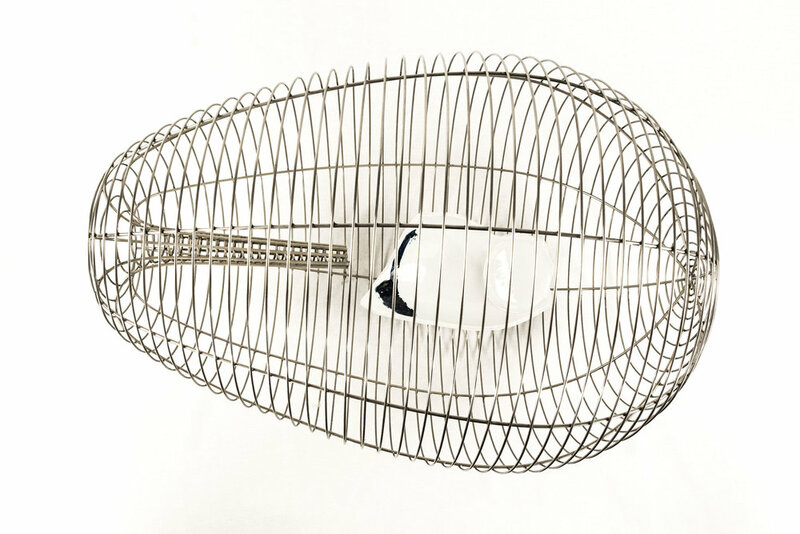 EI stood for ‘Entity/Identity’, but it is also the Dutch word for ‘egg’, the form I ended up with when I decided to make a birdcage, in collaboration with the Yin Sum atelier, a workshop that normally produces kites. We created three cages of which two in stainless steel and one in bamboo strips. One stands upright; the two others lie on their side. I tried to create an object that would unite the many functions of the cage into one seamless design. 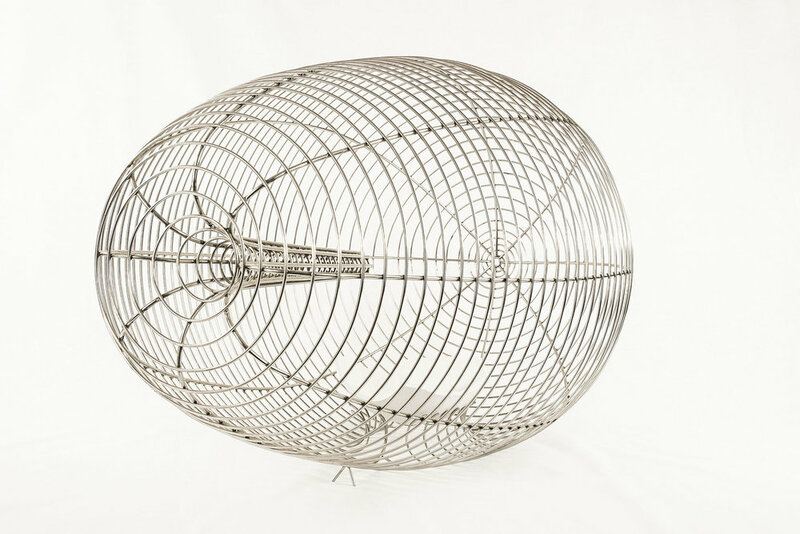 In each of the cages the curvy lattice organically bulges inwards, creating two ‘implosions’. The first bulge – long and tiny – is an alternative for the traditional stick on which the birds sits and rests. The second – short and wide – offers ample space for an arm to access the birdcage, while it also serves as a pedestal for a broken but precious piece of ceramic that closes the cavity, so that the birds can’t escape. The ceramic fragments are an ode to Chinese tradition that still cultivates the imperfect, the weather- beaten and broken as exceptional qualities – in great contrast to our vision on design. Two cultures – east and west, old and new – have been confronted and brought together in harmony in one single object. However, it is the old and broken piece of ceramic that is put on a pedestal." Other participating artists: Ai Weiwei, Marina Bautier, Nathalie Dewez, Gésine Hackenberg, Chris Kabel, Toon Koehorst & Jannetje in ’t Veld, Romy Smits, Wieki Somers, Diane Steverlynck en Pieter Vermeersch.